You have the power to make the decision to quit and feel great! Did you know that men who smoke raise their risk of lung cancer by more than 22 times? Did you know that smoking could affect more than just your lungs? Smoking around your wife, partner, or children can also cause serious health problems for them. They have a higher chance of developing lung cancer, asthma, allergies, ear infections, and other health problems. Smoking around your pregnant wife or partner can also cause health problems for her and your baby. If your wife or partner smokes, it increases her chances of having a miscarriage (losing her pregnancy), stillbirth (the baby dying in her womb), infant death, premature or early birth, or having a baby with low birth weight. Smoking also affects your baby when she breast feeds. If she smokes and breast feeds, your baby is exposed to the same harmful chemicals. Heavy smoking can reduce your wife's or partner's milk supply and can cause nausea, vomiting, abdominal cramps, and diarrhea in your baby. But health care providers agree, if she has tried to quit smoking and can't, it still is better to breast feed your baby than to give your baby formula. 'Light' cigarettes aren't safe either You may think that "light" cigarettes are less harmful than regular cigarettes. They're not. Light cigarettes put smokers at the same risk for smoking-related health problems as regular cigarettes. Some cigarette packs say that light cigarettes have lower tar and nicotine. Don't let these claims fool you. Tobacco companies use smoking machines to figure out the amount of tar and nicotine in the cigarettes. These machines "smoke" every brand of cigarettes the same way. However, people don't smoke cigarettes the same way machines do. People may inhale more deeply, take longer or more frequent puffs, or smoke extra cigarettes to satisfy their nicotine craving. Smokers then inhale more tar, nicotine, and other chemicals than the smoking machine measures. Another way that tobacco companies try to make light cigarettes is by putting tiny holes in the filters to dilute the smoke with air. However, many smokers block the holes with their fingers or lips, and it's the same as smoking regular cigarettes. Your blood pressure drops back to normal. The temperature in your hands and feet increases, returning to normal. The carbon monoxide (a gas that can be toxic) in your blood drops to normal. Your chance of having a heart attack goes down. Your lungs are working better. Your lungs start to function better, lowering your risk of lung infection. You reduce your risk for heart disease by half. Your risk of having a stroke is the same as someone who never smoked. Your risk of lung cancer is nearly the same as someone who never smoked. Your risk of cancer of the mouth, throat, esophagus, bladder, kidney, and pancreas also decrease. Your risk of heart disease is now the same as someone who never smoked. You have the power to make the decision to quit and feel great! 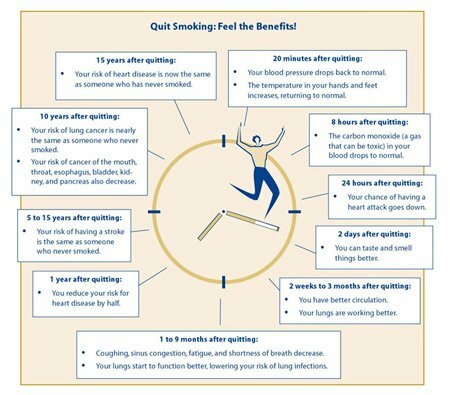 Did you know that many people try to quit two or three times before they are able to give up smoking for good? Nicotine is a very addictive and powerful drug-it's as addictive as heroin and cocaine. The good news is that millions of people have given up smoking for good. It's hard work to quit, but you can do it! Follow these steps to help you to quit for good: Pick a date to stop smoking. Plan to quit in the next two weeks. Think about choosing a special day. If you smoke at work, quit on the weekend or during a day off, so you'll be cigarette-free when you return. Tell family, friends, and coworkers that you plan to quit. Let the people important to you in your life know the date you will be quitting and ask them for their support. Ask them not to smoke around you or leave cigarettes out around you. Create a fund. Each time you would normally buy a pack of cigarettes, put that saved money in a special place, such as an empty jar or envelope. Set a goal for yourself. Once you reach your goal, reward yourself! Help yourself by knowing when you're tempted to smoke and how you'll get through the craving without it! Write down the times you're tempted to smoke and a list of things that you will do instead. Plan for challenges. Think about when you might be tempted to smoke, and try to be ready for those times. For example, when you get the urge to smoke, try to do something different-talk to a friend, go for a walk, or do something you enjoy like gardening or going to the movies. Try to reduce your stress with exercise, meditation, hot baths, or reading. Have sugar-free gum around to help handle your cravings. Drinking lots of water or other fluids also helps. You might want to change your daily routine as well-try drinking tea instead of coffee, eating your breakfast in a different place, or taking a different route to work. Remove cigarettes from your home, car, and workplace. Get rid of things that remind you of smoking. Get rid of all cigarettes, ashtrays, and lighters in your home, car, and workplace. Talk to your health care provider about medicines to help you quit. Some people have symptoms of withdrawal when they quit smoking, such as depression; not being able to sleep; feeling cranky, frustrated, nervous, or restless; and trouble thinking clearly. Even though smoking doesn't suppress appetite, you may also feel hungry. There are medicines to help relieve these symptoms. Most medicines help you quit smoking by giving you small, steady doses of nicotine, the drug in cigarettes that causes addiction. Talk to your health care provider about which of these medicines is right for you:?